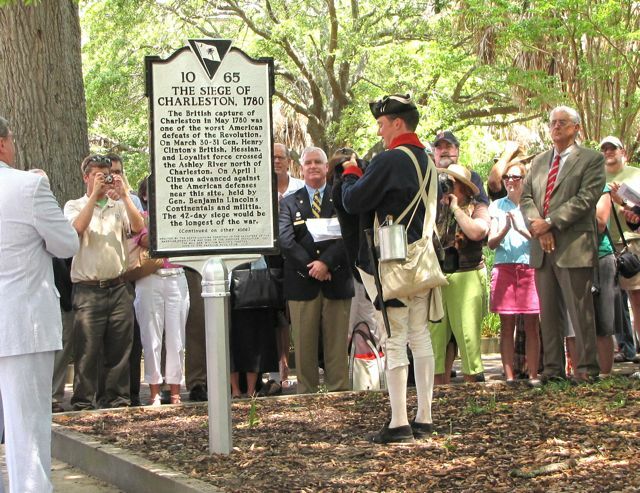 At noon today in Charleston, a crowd of more than fifty ladies and gentlemen gathered in Marion Square to witness the unveiling of a new historical marker commemorating the six-week British siege of the city in 1780 and the 230th anniversary of the surrender of Charleston. 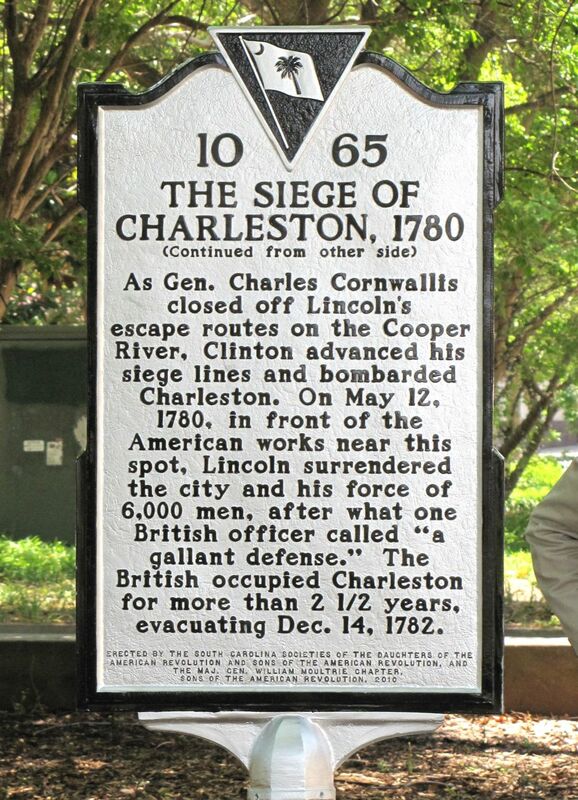 The marker, placed at the western edge of Marion Square, next to the east side of King Street, briefly summarizes the British siege and its significance to the larger story of the American Revolution. Before today, there was no signage of any kind to acquaint passing residents and tourists with the dramatic story of the siege and the military significance of the site. For those of you who haven’t yet seen the marker, I photographed both sides for your reading pleasure. The west side of Marion Square represents the center of the American defensive line during that fateful siege. Between 1757 and 1759 a large tabby fortress, a “Horn Work,” was erected on the site, and it served as the gateway into the city for the next twenty-five years. Between 1776 and May 1780, the American forces also built a series of elaborate fortifications north of and on each side of the Horn Work, stretching the entire distance between the Ashley and Cooper Rivers. The British army landed on the northern neck of the Charleston peninsula at the end of March 1780 and relentlessly bombarded the American defenders as they crept southward towards these defensive works. After a six-week siege, the American forces surrendered the town to Sir Henry Clinton just after noon on the 12th of May, 1780. 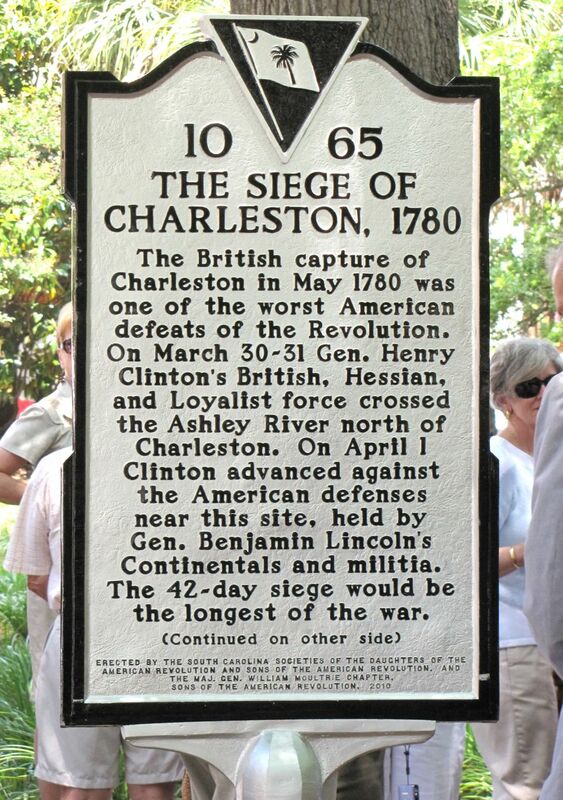 It was the most elaborate siege in the course of the American Revolution, and the capitulation of Charleston proved to be the largest American surrender during the war. Anyone interested in learning more about the events leading up to the surrender of Charleston on 12 May 1780 should read Carl Borick’s book, A Gallant Defense: The Siege of Charleston, 1780 (University of South Carolina Press, 2003). We all owe a great debt of gratitude to Mark Maloy, who spearheaded the campaign to erect the marker and coordinated the group effort to draft its text. Over the course of about seventeen months, Mark brought together a number of organizations that endorsed and helped bring the project to fruition, including the Maj. Gen. William Moultrie Chapter of the Sons of the American Revolution, the South Carolina Society of the Sons of the American Revolution, the South Carolina Society of the National Society of the Daughters of the American Revolution, the Washington Light Infantry/Sumter Guards Board of Officers, the City of Charleston, the South Carolina Department of Archives and History, and Sewah Studios. Hats off to Mark and all the supporters–Huzzah!